NC Service went into online marketing in 2014, aware of the tremendous business opportunities that this channel could offer us. We therefore started to strengthen our presence on the internet, firstly by revamping our website shop window through the design and launch of a new, more optimised website for increased internet visibility. All this was achieved with the collaboration of the online marketing agency, Overalia. NC Service´s online visibility strategy brought with it increased business in the sale and purchase of industrial machinery and milling machines, both nationally and internationally. Our goal was to achieve the greatest possible dissemination of our catalogue of retrofitted milling machines primarily in the various digital channels, yet without excluding the traditional publication and advertising means in paper format in a number of specialised media. To date, the results have been impressive, whilst specific mention should be made of the fact that we have tripled the number of contacts interested in our milling machines, received through the NC Service website, whilst the organic traffic through search engines has increased by 130%. This whole process, directed at attracting potential customers, is clearly the first step towards ultimately achieving increased sales. 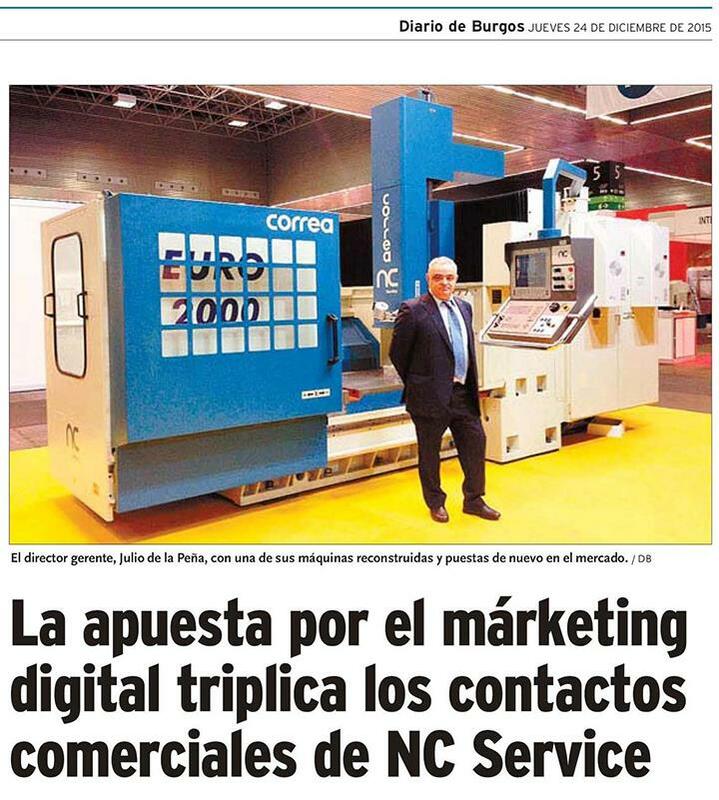 The Diario de Burgos news item, published on Christmas Eve, summarised NC Service´s trajectory to date and the good results obtained for its retrofitted milling machines through the company´s digital marketing strategy. Other media have also echoed this article, such as Globedia, ArticuloZ and Overalia itself, reflecting the positive impact of online marketing on NC Service, primarily with regard to attracting potential customers interested in our machines and technical support service. Clearly, NC Service will continue along these lines in the future, in our ongoing commitment to online marketing, seeking new strategies that will allow us to further increase the qualified leads interested in our machines and, of course, to increase sales.